You're quoting from, say, a British document, and see the word "colour" flagged as misspelled. When that happens, you can mark the selected text as UK English. 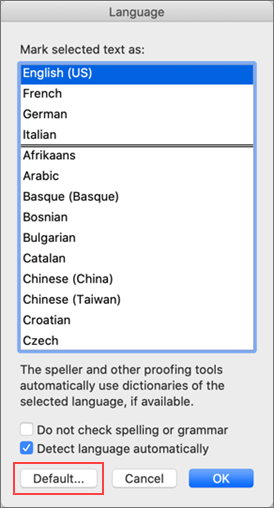 On the Tools menu, click Language, and then select your language. Note: Documents created previously will not be affected. Having trouble setting the language to check spelling and grammar? Contact us.